You're invited to "A HOT NIGHT OF COMEDY" presented by 41 Bridge Street and the Canton Chamber of Commerce! 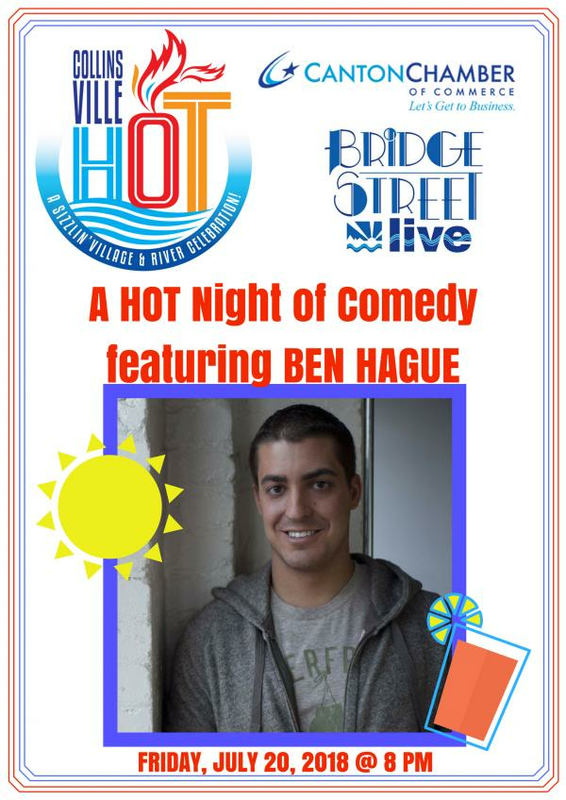 On Friday, July 20th, 2018, the night before COLLINSVILLE HOT, BEN HAGUE will be bringing the laughs to Bridge Street for a Comedy Fundraiser to benefit the Canton Chamber of Commerce and their scholarship fund! Show starts at 8 pm, doors to the Show Room open at 7 pm, and food will be served in the Green Door from 5 pm on. The Canton Chamber of Commerce annually awards scholarships to graduating students at the Canton High School each year in June. Proceeds from the Annual Golf Tournament, fundraising events, and donations benefit the scholarship fund. The Chamber Outreach Committee advertises for and receives applications from Canton High School seniors who are pursuing a college degree in the business field or entrepreneurship. With 3.7 million viewers seeing him kill on the Late Late Show on CBS, and a monthly following on SiriusXM radio, BEN HAGUE is on his way to becoming the next big thing in comedy. At 21, after attending the American Academy of Dramatic Arts in Manhattan, Ben moved to LA to pursue a career in comedy. He debuted his stand-up act at the world-famous comedy club Laugh Factory on Sunset Boulevard in 2003, and never looked back. Since then he has been privileged to share the stage with such talents as Dane Cook, Dave Attel, Louis CK, Robert Klein, Jeffrey Ross, Amy Schumer and many others. Ben was a finalist in the Orange County "Laff Down" (2003) and Orange County "California's Funniest Person" two years running (2004, 2005). He won the "Catch A 'New' Rising Star" competition in his home state of Rhode Island in 2006. Ben has headlined at comedy clubs throughout the US, hundreds of colleges nationally, and performed at the prestigious Fringe Festival in Scotland in 2011. In 2009, Ben won a hosting spot on FOX Providence's "The Rhode Show", beating out hundreds of other contestants. After his one year booking ended, he was immediately signed by the top morning radio show in New England, the "Giovanni and Kim Show" on 92.3 WPRO FM, with over 300,000 listeners weekly. In 2014, Ben wrote, produced and starred in a short war drama, "Getting Home", which was accepted into the Action On Film International Film Festival in California. His next film, "Into Temptation", is currently in pre-production. Ticket to A HOT Night of Comedy featuring Ben Hague are $15 for General Admission and $25 for VIP Reserved (+ fees).